I'm here at HSN. I have the craft TODAY SPECIAL. Follow me on Facebook and instagram for updates. 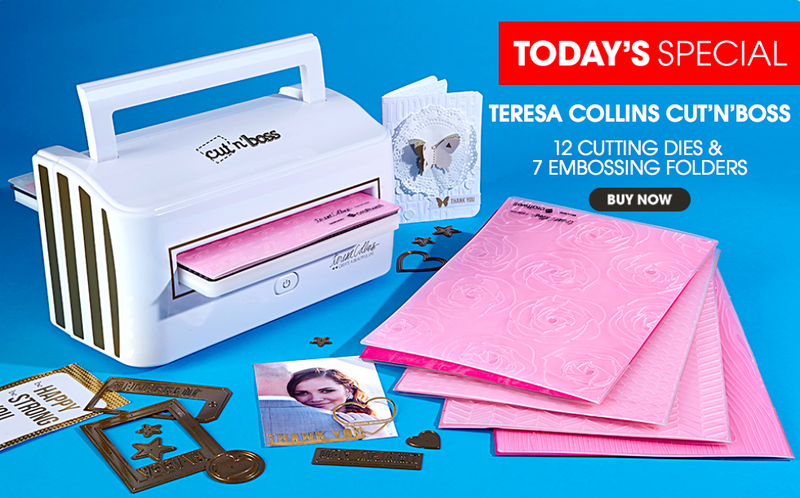 I cannot believe how many of you have already bought the Teresa Collins Cut n' Boss. click HERE to go to HSN and see all that you get with the machine for such a steal today! You will get 7 folders, 12 die cuts, the machine... I can't believe all that you will get. Its an amazing bundle. And if you thought it could not get better then that there is a Auto Ship option of 2 folders and a set of dies shipped to you every 3 months starting in August. The only way to take advantage of this Auto Ship is to purchase the Cut 'n Boss Bundle. I will be on today at 8am, 11am, 3pm, 4pm, 9pm, and 10pm EST. Remember it is the TODAY special so if you wait you will not receive this great price with this bundle. It is all wonderful. I just bought the ebosser last time you were on. Wish I had waited for the new But I do love my machine so will keep using it. I hope you make the dies and folders extra sometime so those of with ebosser already can get them. The show today is great. My husband and I watched you on HSN last night. I was telling him about Ty...Bless you both. We are praying!!! I agree with Dee. I did the same thing. Would be nice to have a bundle of the dies and folders to purchase separate from the machine. I agree I just got an ebosser and can't afford to replace it so quickly, but would still love to buy the new folders and dies. oh, I am soooo jealous, we can't buy from HSN up here in Canada - don't know when we will ever get to purchase :( LOVE TC, will stalk the online stores for months and months to come. Where is the Printer you mentioned? I also bought your other e-Bosser from HSN and I'm still making payments. So disappointed I didn't wait. :-( I think what bothers me a lot is the fact that HSN has totally disregarded your previous customers and they don't offer the dies and folders to us as an autoship without buying this new machine. Why is that? I, too, bought the new embosser! I couldn't resist. I'll either sell my old machine or donate it to my grandkids school. Mostly, I wanted the new dies and folders. I already know the machine will be awesome. Theresa your hair looks fabulous! You should wear it curled all the time! Makes it soft and looks healthy and girlie!